The Berbers (Imazighen, singular Amazigh) are an ethnic group indigenous to Northwest Africa, speaking the Berber languages of the Afroasiatic family.They are the descendents of the pre-Arab populations of North Africa from the Egyptian frontier to the Atlantic and from the Mediterranean coast to the Niger River. Originally, Berber was a generic name given to numerous heterogeneous ethnic groups by the Romans that shared similar cultural, political, and economic practices. It was not a term originated by the group itself. Despite the appearance of two significant Berber dynasties, the Almoravids (eleventh century) and the Almohads, (twelfth century) the Berber tribes could never unite long enough to rid themselves of the numerous conquerors who invaded their lands. As a result, Berber history can only be followed as the history of individual tribes. Some of these ancient tribes were Gaetulians, Maures, Massyli, Garamantes, Augilae, and Nasamones. While Berbers are stereotyped as nomads, and indeed some tribes are, the majority are typically farmers. 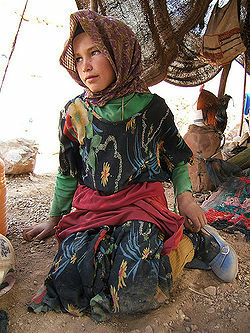 It is difficult to estimate the number of Berbers in the world today, because many do not define themselves as Berber. However the Berber language is spoken by an estimated 14 to 25 million people. The Berbers have lived in North Africa for thousands of years and their presence has been recorded as early as 3000 B.C.E. Greeks, Romans, and ancient Egyptians have indicated the presence of Berbers in their records. There is no complete certitude about the origin of the Berbers; however, various disciplines shed light on the matter. Historically, it is not clear how the name "Berber" evolved, although it is supposed to be from the word "barbarian," applied by Romans to many peoples. The variation is a French one when spelled Berbere and English when spelled "Berber." 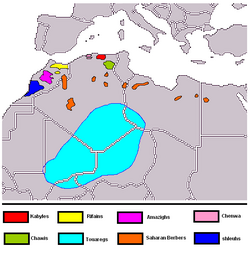 Due to the fact that the Berbers were called "El-Barbar" by the Arabs, it is very probable that the modern European languages adopted it from the Arabic language. The Arabs didn't use the name "El-Barbar" as a negative, not being aware of the origin of that name; they supposedly created some myths or stories about the name. 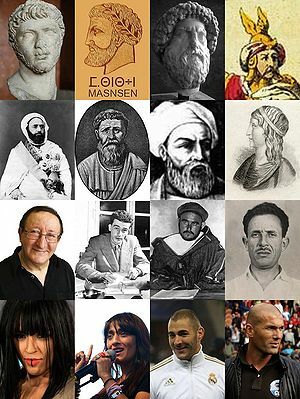 The most notorious myth considers "Barbar" as an ancestor of the Berbers. According to that myth, the Berbers were the descendants of Ham, the son of Noah, the son of Barbar, the son of Tamalla, the son of Mazigh, the son of Canon… ([Ibn Khaldun]/ The History of Ibn Khaldun - Chapter III). The fact that the name "Berber" is a strange name to the Berbers leads to confusion. Some sources claim that the Berbers are several ethnic groups who are not related to each other. That is not accurate, because the Berbers refer to themselves as Imazighen (singular Amazigh) in Morocco, as well as in Libya, Egypt (Siwa) and other areas of North Africa, and speak the Berber language Tamazight. Not only is the origin of the name "Berber" unclear, but also is the name "Amazigh." The most common explanation is that the name goes back to the Egyptian period when the Ancient Egyptians mentioned an ancient Libyan tribe called Meshwesh. The Meshwesh are supposed by some scholars to be the same ancient Libyan tribe that was mentioned as "Maxyans" by the Greek Historian Herodotus. Both names, "Amazigh" and "Berber," are relatively recent names in historical sources, since the name "Berber" appeared first in Arab-Islamic sources, and the name "Amazigh" was never used in ancient sources. It is no less important to keep in mind that the Berbers were known by various names in different periods. The first reference to the Ancient Berbers goes back to a very ancient Egyptian period. They were mentioned in the pre-dynastic period, on the so-called "Stele of Tehenou" which is still preserved in the Cairo museum in Egypt. That tablet is considered to be the oldest source wherein the Berbers have been mentioned. The second source is known as The Stele of King Narmer. This tablet is newer than the first source, and it depicted the Tehenou as captives. The second oldest name is Tamahou. This name was mentioned for the first time in the period of the first king of the "Sixth Dynasty" and was referred to in other sources after that period. According to Oric Bates, those people were white-skinned, with blond hair and blue eyes. In the Greek period the Berbers were mainly known as "The Libyans" and their lands as "Libya" that extended from modern Morocco to the western borders of ancient Egypt. Modern Egypt contains Siwa, part of historical Libya, where they still speaks the Berber language. During the Roman period, the Berbers would become known as Numidians, Maures, and Getulians, according to their tribes or kingdoms. The Numidians founded complicated and organized tribes, and thereafter began to build a stronger kingdom. Most scholars believe that "Alyamas" was the first king of the Numidian kingdom. Massinissa was the most famous Numidian king, who made Numidia a strong and civilized kingdom. The Berbers have lived in North Africa between western Egypt and the Atlantic Ocean for as far back as records of the area go. The earliest inhabitants of the region are found on the rock art across the Sahara. References to them also occur frequently in Ancient Egyptian, Greek, and Roman sources. Berber groups are first mentioned in writing by the ancient Egyptians during the Predynastic Period, and during the New Kingdom the Egyptians later fought against the Meshwesh and Lebu (Libyans) tribes on their western borders. Many Egyptologists think that from about 945 B.C.E. the Egyptians were ruled by Meshwesh immigrants who founded the Twenty-second Dynasty of Egypt under Shoshenq I, beginning a long period of Berber rule in Egypt, although others posit different origins for these dynasties, including Nubian. They long remained the main population of the Western Desert—the Byzantine chroniclers often complained of the Mazikes (Amazigh) raiding outlying monasteries there. 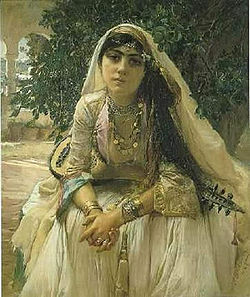 For many centuries the Berbers inhabited the coast of North Africa from Egypt to the Atlantic Ocean. Over time, the coastal regions of North Africa saw a long parade of invaders and colonists including Saharans, Phoenicians (who founded Carthage), Greeks (mainly in Libya), Romans, Vandals and Alans, Byzantines, Arabs, Ottomans, and the French and Spanish. Most, if not all, of these invaders have left some imprint upon the modern Berbers as have slaves brought from throughout Europe (some estimates place the number of Europeans brought to North Africa during the Ottoman period as high as 1.25 million). Interactions with neighboring Sudanic empires, sub-Saharan Africans, and nomads from East Africa also left vast impressions upon the Berber peoples. In historical times, the Berbers expanded south into the Sahara, displacing earlier populations such as the Azer and Bafour, and have in turn been mainly culturally assimilated in much of North Africa by Arabs, particularly following the incursion of the Banu Hilal in the eleventh century. The areas of North Africa which retained the Berber language and traditions have, in general, been those least exposed to foreign rule—in particular, the highlands of Kabylie and Morocco, most of which even in Roman and Ottoman times remained largely independent, and where the Phoenicians never penetrated beyond the coast. However, even these areas have been affected by some of the many invasions of North Africa, most recently including the French. Another major source of foreign influence, particularly in the Sahara, was the Trans-Atlantic Slave trade route from West Africa, operated in part by the European commercial powers. Nonetheless, the Islamization and Arabization of the region were complicated and lengthy processes. Whereas nomadic Berbers were quick to convert and assist the Arab conquerors, not until the twelfth century, under the Almohad Dynasty, did the Christian and Jewish communities become totally marginalized. The Berber languages are a group of closely related languages belonging to the Afro-Asiatic languages phylum. There is a strong movement among Berbers to unify the closely related northern Berber languages into a single standard, Tamazight, which is a frequently used generic name for all Berber languages. There are around three hundred local dialects among the scattered Berber populations. The exact population of Berber speakers is hard to ascertain, since most Maghreb countries do not record language data in their census data. Early colonial censuses may provide documented figures for some countries; however, those statistics are no longer a reliable measure. It is estimated that there are between 14 and 25 million speakers of Berber languages in North Africa, principally concentrated in Morocco and Algeria, with smaller communities as far east as Egypt and as far south as Burkina Faso. Among the Berber languages are Tarifit or Riffi in northern Morocco, Kabyle in Algeria and Tashelhiyt in central Morocco. Tamazight has been a written language, on and off, for almost 3,000 years; however, this tradition has been frequently disrupted by various invasions. It was first written in the Tifinagh alphabet, still used by the Tuareg; the oldest dated inscription is from about 200 B.C.E. Later, between about 1000 C.E. and 1500 C.E., it was written in the Arabic alphabet, particularly by the Shilha of Morocco; since the beginning of the twentieth century, it has often been written in the Latin alphabet, especially among the Kabyle. A variant of the Tifinagh alphabet was recently made official in Morocco, while the Latin alphabet is official in Algeria, Mali, and Niger; however, both Tifinagh and Arabic are still widely used in Mali and Niger, while Latin and Arabic are still widely used in Morocco. After independence, all the Maghreb countries, to varying degrees, pursued a policy of "Arabization," aimed primarily at displacing French from its colonial position as the dominant language of education and literacy. But under this policy the use of both Berber languages and Maghrebi Arabic have been suppressed as well. This state of affairs has been contested by Berbers in Morocco and Algeria, especially Kabylie, and is now being addressed in both countries by introducing Berber language education and by recognizing Berber as a "national language," though not necessarily an official one. No such measures have been taken in the other Maghreb countries, whose Berber populations are much smaller. In Mali and Niger, there are a few schools that teach partially in the Tamasheq language. Most belonging to the Maliki madhhab, while the Mozabites, Djerbans, and Nafusis of the northern Sahara are Ibadi Muslim. Sufi tariqas are common in the western areas, but rarer in the east; marabout cults were traditionally important in most areas. Before their conversion to Islam, some Berber groups had converted to Christianity (often Donatist) or Judaism, while others had continued to practice traditional polytheism. Under the influence of Islamic culture, some syncretic religions briefly emerged, as among the Berghouata, only to be replaced by Islam. Berber Jews inhabit the region coinciding with the Atlas Mountains in Morocco, Algeria and Tunisia. Between 1950 and 1960 most immigrated to Israel. Some 2,000 of them, all elderly, still speak Judeo-Berber. Their garb and culture was similar to neighboring Berber Muslims. It would be difficult to determine whether these Jewish Berber tribes were originally of Jewish descent and had become assimilated with the Berbers in language, habits, mode of life—in short, in everything except religion—or whether they were native Berbers who in the course of centuries had been converted by Jewish settlers. It is the second option which is considered as more likely by researchers such as André Goldenberg or Simon Levy. The question on the origins of the Berber Jews is also further complicated by the likelihood of intermarriage. However this may have been, they at any rate shared much with their non-Jewish brethren in the Berber territory, and, like them, fought against the Arab conquerors. The Berbers live mainly in Morocco (between 35 percent-60 percent of the population) and in Algeria (about 15 33 percent of the population), as well as Libya and Tunisia, though exact statistics are unavailable. Most North Africans who consider themselves Arab also have significant Berber ancestry. Prominent Berber groups include the Kabyles of northern Algeria, who number approximately four million and have kept, to a large degree, their original language and culture; and the Chleuh (francophone plural of Arabic "Shalh") and Tashelhiyt of south Morocco, numbering about eight million. Other groups include the Riffians of north Morocco, the Chaouia of Algeria, and the Tuareg of the Sahara. There are approximately three million Berber immigrants in Europe, especially the Riffians and the Kabyles in the Netherlands and France. Some proportion of the inhabitants of the Canary Islands are descended from the aboriginal Guanches—usually considered to have been Berber—among whom a few Canary Islander customs, such as the eating of gofio, originated. As with most people in the world today, Berbers easily blend in with other people. However, there are differences due to North Africa's history, known as the Barbary Coast. 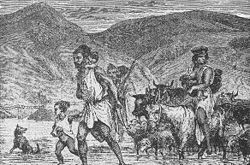 During the time of the Barbary pirates, slaves and war prisoners from Europe were transported and sold into North Africa. Estimates place possibly one million Europeans arriving in Africa this way, bringing with them green and blue eyes and blond and red hair. As intermarriage took place with the resident North Africans, these features became incorporated into today's Berber population. Today Berbers often live in the mountains and in smaller settlements throughout the North African terrain. Of the region's major cities, only Marrakech has a population with a strong Berber identity. During the days of the Arab conquest, the invaders took control of the cities, for the most part ignoring the rural areas. The Berber peoples had several choices; living in the mountains, resisting Arab dominance, or moving into the Arab community, where Arab language and culture were dominant. Many chose a mountain life, where their descendents remain today. Similar to the situation in many Western societies such as Native peoples in the U.S., Aboriginals in Australia, and Lapps in Norway, the Berbers were considered to be second class citizens until the middle of the twentieth century. In some areas of northern Africa, the Berber people continue to be looked upon as 'illiterate peasants' dressed in traditional garments. As with many other indigenous peoples throughout the world, the Berbers had begun to rise up in the latter years of the twentieth century, speaking out against the undervaluation of their culture and identity. Major points of protest have been the absence of a written language and the lack of political influence. This has been most obvious in Algeria, where the situation had been so tense during the 1990s, that foreign commentators had speculated about the prospects for a civil war and a partition of the country. Today the Berbers of Algeria are the most educated group, and many hold leading positions in society. This is due in part to the actions of the French during the colonial period, who attempted to weaken the Arab aspects of Algerian culture by giving preference to Berbers in education and administration. This has resulted in Algeria having one of the most influential Berber cultures of all countries with a Berber population. 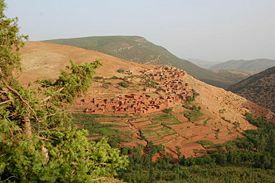 The Berber language is used as an everyday language in that country, though French is the administrative language. Political tensions have also arisen between some Berber groups, especially the Kabyle, and North African governments over the past few decades, partly over linguistic and cultural issues; for instance, in Morocco, giving children Berber names was banned. ↑ Thinkquest Library. 1998. The People - Berber Retrieved January 25, 2008. ↑ J.D. Irish, 2000. The Iberomaurusian enigma: north African progenitor or dead end? National Library of Medicine. Retrieved January 25, 2008. ↑ Peter Prengaman, Morocco's Berbers Battle to Keep From Losing Their Culture, San Francisco Chronicle (March 16, 2001). Retrieved October 28, 2011. ↑ Jeff Grabmeier, "When Europeans were Slaves: Research Suggests White Slavery was much more Common than Previously Believed." In Robert Davis, Christian Slaves; Muslim Masters. (London: Palgrave Macmillan, 2004. ISBN 978-1403945518). ↑ Kjeilen Berbers Encyclopedia of the Orient. Retrieved January 25, 2008. ↑ Raymond G. Gordon, Jr. Judeo-Berber: A language of Israel Ethnologue: Languages of the World, Fifteenth edition. Retrieved January 25, 2008. ↑ Raymond G. Gordon, Jr. (ed. ), 2005. Languages of the World Ethnologue: Languages of the World, Fifteenth edition. Retrieved January 25, 2008. ↑ Jaume Bertranpetit, . March 14, 2001. High-Resolution Analysis of Human Y-Chromosome Variation Shows a Sharp Discontinuity and Limited Gene Flow between Northwestern Africa and the Iberian Peninsula The American Society of Human Genetics. Retrieved January 25, 2008. ↑ Tore Kjeilen, Berbers Encyclopedia of the Orient. Retrieved January 25, 2008. ↑ Tore Kjeilen, Algeria: Religions & Peoples Encyclopedia of the Orient. Retrieved January 25, 2008. Lewis, M. Paul (ed.). Ethnologue: Languages of the World, Sixteenth edition. Dallas, TX: SIL International, 2009. Retrieved October 22, 2011. Amar Almasude, The New Mass Media and the Shaping of Amazigh Identity Revitalizing Indigenous Languages. Jose Barrios Garca, Sept 1997 Number Systems and Calendars of the Berber Populations of Grand Canary and Tenerife Archaeoastronomy & Ethnoastronomy News. This page was last modified on 14 December 2016, at 16:44.